They are far different in comparisons for your Dealership and Strategy for your online dealership marketing. Here are a few things to take into consideration when understanding the difference between the two. As a Fan Page represents a business, a Fan is someone who has trusted your business, loves what you do or have done for them, which helped them come to you by word of mouth, promotions, service, new purchase, events & dealership branding. Earning fans are a chore and if you haven’t earned them, you need to start looking at ways to do so. As a Friend / Profile Page representing your business, your dealership is all ready stepping in “HOT WATER” with Facebook Policies. A Friend page is more commonly used for interacting with friends or family. Selecting a Friend is easy for your Dealership, cuts out the hard work the internal social media manager that you have employed within your dealership. Why not? The number of “Friends” on your Facebook Friend / Profile Page looks better to the higher ups when asked where the Dealership Social Media Efforts are heading. The benefits of a Friend / Profile Page is many of us as individuals have one. Your internal staff, office staff etc. can leverage their friends and family to “Like” your Dealers Fan Page. Friends and Family rely on suggestions from you! Now what happens when Facebook gives you the warning? You will try your hardest to move those Friends over to Fans. 90% of the time you will find yourself chasing them to “Like” that specific page. That right there tells you “You didn’t actually earn the status of trustworthy to be a Fan”. Let me ask you this “What are you going to say to them when Facebook shuts you down”…………? You might as well pack up your bags and take a walk. Dealerships across the nation have been thrown over backwards by invalid titles & invalid expertise. A Fan is more a valued asset to the dealership in their branding, product & service, which is provided to the Fan base, they have accumulated. If you are not offering the best of services to the customer they are long gone. A Fan is earned by their experience and more of quality holdings when they are ready to purchase their next vehicle or service. Your Dealership is more likely to show up in their newsfeed with what you have to share with them and your earned Fans. Fan Pages provides reporting for Interactions & Engagements of how many views your post has received and feedback. Friend / Profile Pages do not, as they are not intended for Businesses / Dealerships. A Fan provides your Dealership higher chances to spread the word to their family & friends about service they have received & suggest your page to their family & friends. What are your thoughts on the difference of a Fan & a Friend? Are you putting your Dealership Social Media Efforts in the midst of being shut down by Facebook? Thanks Stacy! I am so glad you agree! I see this everyday of consistent friendship request by dealers all across the board. I had one dealer / Internet Manager approach me saying they had a large dealer group meeting and he was explaining to them of the difference based on some recent post. The response was from another one of the stores "I have over 700 friends and you only have 300 fans"... Ouch..! We are going to experience a lot of this Stacy as we try our best to educate dealers however in his situation he is doing his part as he has a good start of earning those fans then cheating the friends. That is how I consider it. Yes, yes, yes. You are absolutely right. 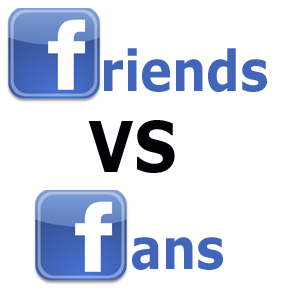 I think many people simply don't realize that there is a different between a Fan and Friend page. Facebook does not want businesses to be able to solicit people by asking them to be their "friend." You must earn it. Along with everything you previously mentioned, having your page set up as a friend might make you less visible in search results. If somebody is looking for "XYZ Dealership" and it shows up as a personal page, they then must request your friendship before they can see your information and interact with you. It's just one road block you're putting up in connecting with customers.